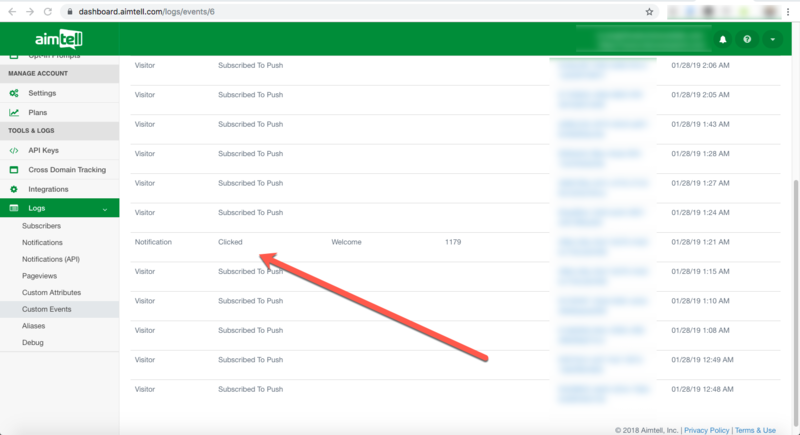 In some cases you may find yourself looking to create a notification that goes out automatically after a subscriber clicks on another push. This can be one off, or part of a series. Fortunately, thanks to various features in Aimtell, this is quite easy to set up. 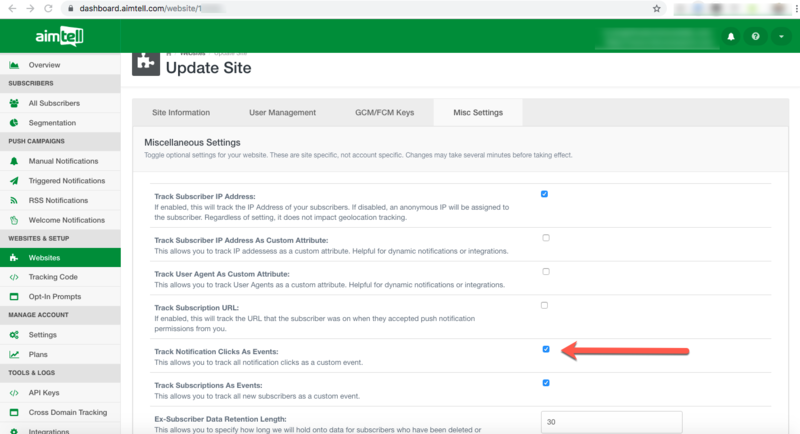 As you may already be aware, Aimtell offers you to optionally enable various tracking points for your site within the Website Settings section. 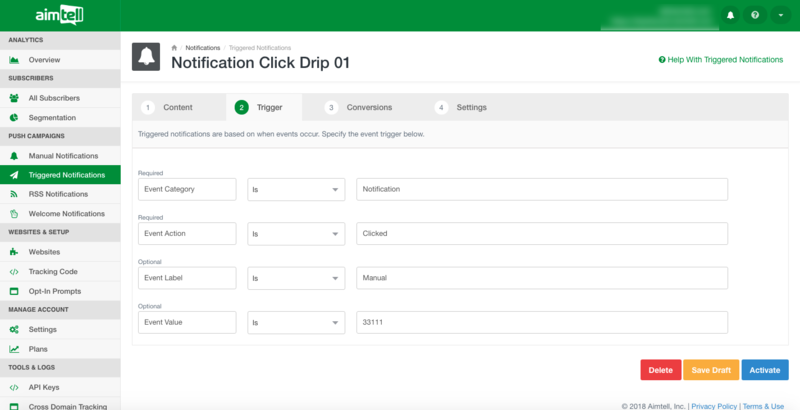 In order to properly set up a Notification Drip Notifications, you'll need to make sure that you've enabled the 'Track Notification Clicks as Events' option for your website. After you've enabled that, you'll start seeing your Event Logs fill in with the custom event of "Notification" "Clicked". If you don't see these immediately, that's ok. It often can take up to 5 minutes for the update to kick in and start tracking the event. Next up, head to your Triggered Notifications and create a new campaign. To make things easy, call it Notification Click Drip 01. Once you've jumped into the edit section, fill in the content of the push you'd like to send and then click on the second tab, "Trigger". On this page you'll specify the trigger that will trigger this notification to go out. Set the Category to "Notification", Action to "Clicked", Label as "Manual" and Value as "33111" as shown in the screenshot below. Finally, select the fourth tab "Settings" and specify the delay that you'd like for this notification. In the example below, we're setting this push to go out 1 hour after they have clicked on our Manual Campaign. Now, to effectively turn this into a Drip Campaign, simply create several more campaigns with different delays. 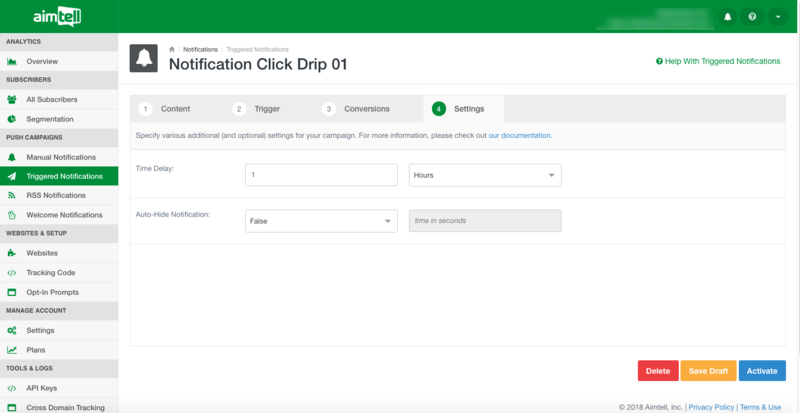 For instance, create another triggered campaign called "Notification Click Drip 02" and set a delay of 2 hours. And that's it! Your new subscribers will now get each one of these notifications after they click on the push and pass the specified delay.